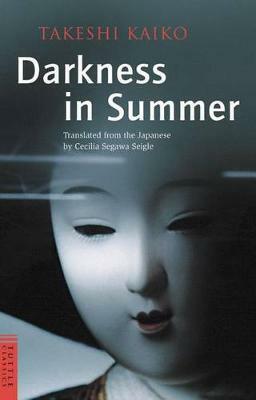 "This intensely modern novel ... provides vivid insights into the alienated condition of a certain type of Japanese whom we may so often glimpse in the streets of Rome or New York--intelligent, perceptive, and desperately lost between two worlds." --Ivan Morris, author of The Nobility of Failure Darkness in Summer is the first serious work of Japanese fiction to focus on the Japanese experience in the West. A man and a woman, separated for ten years, meet again, traveling together in Germany. They had been lovers long ago, in Tokyo; now, incapable of love, they are brought together by sexual desire and by their mutual desperation. No new passion, but their old obsession, may give them back the key to their lives, release them from their terrors, their rootlessness. The woman is a scholar who has come to hate the Japan that allowed her no seriousness, forcing her to pursue a career in the West; the man is a novelist-reporter, lethargic, an uncommitted observer of other people's wars, sunk into detachment by his professional familiarity with tragedy and chaos. They need each other, and yet they cannot fulfill each other's needs. They savor their world together with urgency as they move restlessly from place to place, finally parting again, to survive separately as best they can. Takeshi Kaiko (1930-1989), winner of his country's highest literary awards-both the Akutagawa and the Mainichi-was born and raised in Osaka. He is ranked by Japanese critics, with Kobo Abe, as one of Japan's two most important novelists of the generation since Mishima.